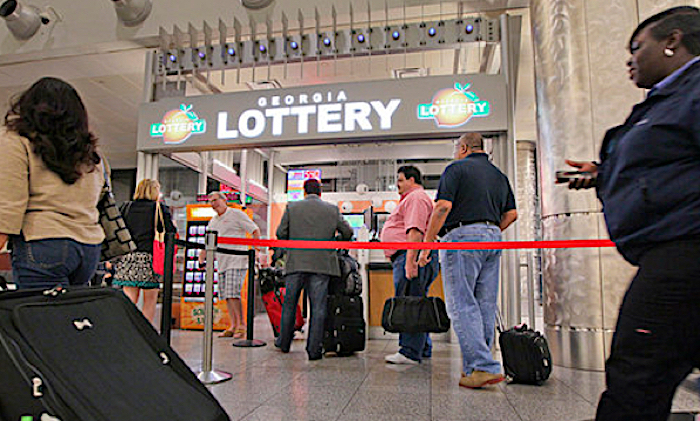 A queue forms for a big draw at a Georgia lottery store, but most of these players are amateurs. Do Silverites have a better chance than the general public for winning the lottery? I was chatting to my local store lady, asking her how the current big draw was selling. "You know," she said, as she flipped my tickets through the machine, "we get more people coming in for the big draws, but they don't pay any more than normal for their tickets." The large draw attract more players, but these people still only spend $5 or $10 a draw. For many of them it's a special occasion - but not special enough to blast out with some real ticket power. The successful people in life tell you to find out what the crowds are doing. Then do the opposite. For some things this true, and the lottery is one of them because most players are attracted by the big jackpot numbers. But of course the more players involved, the greater the chance of the prize being shared by other winners. You only need to go back to this post on multiple winners to see it can happen. One of the answers is to keep playing the small jackpots with the same intensity as the large ones, because very few players are doing it correctly. A customer plays at a UK lottery store, using her passport as proof of age. That's a lot of people - half the population of the United Kingdom. And in the USA it's estimated that 46% of the population have played the lottery - and at least 36 million play each week. All these people contribute towards the giant jackpots and secondary prizes with their ticket money. So that's a good thing. The downside of all these people playing is that the law of averages will sometimes cause some of them to play the same winning numbers as you. Then the prize has to be shared. But the percentage of shared prizes will actually be quite low because - as you've read above - they only play an average of 3 tickets in each game. And a lot of them use quick picks, so no-one wins much at all. Joe Delfino has been playing the lottery for more than 20 years. This video shows the moment that his life could change forever. Will today be the day? VIDEO: Steph Martinez. Therefore the chance of them beating you to the jackpot is unlikely. Just watch Joe Delfino in the video above - his chances are very slim using quickpicks and birthdates for his numbers. Big draws attract more players, but they only play with the same amounts as usual. Most players only buy 3 tickets on average per game, and they're mostly the poor choice quick picks or 'lucky' numbers. So you really don't have any competition. As long as you stick to the System, you'll do better than 99.9% of the population. RELATED:Do You Make These 7 Mistakes Playing Lotto?